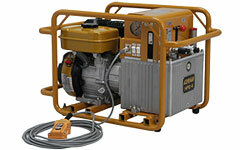 HPE-4 Hydraulic Pumps: Izumi Products. The HPE-4 is a double acting petrol driven hydraulic pump suitable for double acting compression Heads used in transmission line stringing and maintenance. This pump is one of the most sophisticated on today's market. It builds pressure up to 700 bars automatically, and returns the engine RPM to an idle. The push button will control the fluid flow at the discretion of the operator. There is also a manual mode on the pump that can be used to override the remote control. Electric circuit boards are completely modulated for easy replacement and repair. Wired remote control switch, Spark plug wrench, Hydraulic Hoses with quick couplers are available in a variety of lengths to suit all applications call us for pricing.